We build a lot of flagstone patios: last year (2017) we built more of them than any previous year in the business, I believe. 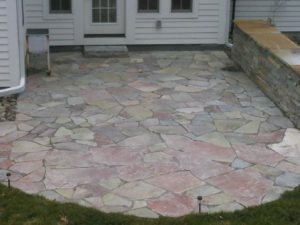 Flagstone patios seem to be gaining in popularity, at least among my clients anyway. Pictured here are a variety of flagstone, from NY Bluestone, to the colorful Chilton stone, to the larger sheets of Heartland stone, and the swirling color patterns in the Tennessee crab orchard, these are but some of the options, but some of the best options it should be noted. Why the growing appeal of these patios? I think people like the natural-ness, the random sizes and shapes of the stone used, and the creative piecing together – puzzle like – of the individual pieces. When done well, and properly, they truly do become works of art underfoot. Some of the color variations among the different stone is also very pleasing to the eye. No two of these patios will ever be the same, and that is to be counted as a strength. 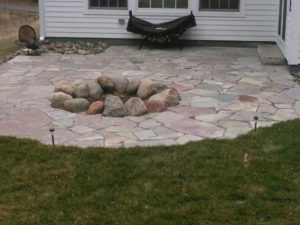 A development in recent years is the use of a polymeric gravel product known in the business by its trade name: Gator Dust. The use of this material in the joints of a flagstone patio renders these joints hard, durable and permanent. 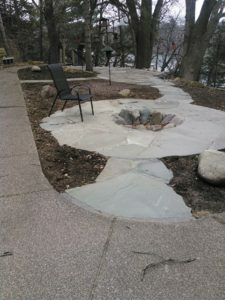 The polymeric gravel is swept dry into the joints, carefully, then misted down repeatedly with a hose, then left overnight to dry and harden. The joints are permanent, and you will get no erosion or weed growth. Sweeping of said patio also becomes much easier.